In a compelling article recently published in World Coal, Deswik Mining Engineer and Business Development Manager, Neil Tyson details ways to improve dragline engineering and in turn improve planning cycle time and mitigate complex risks. Large walking draglines are still a key part of many mining systems around the world, primarily for overburden removal in sedimentary bulk commodities like coal and phosphate. However, during recent boom years the importance of these high volume, low unit cost machines waned. 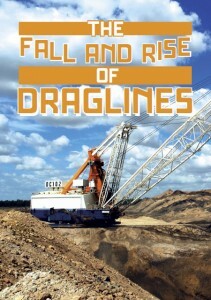 Record prices encouraged mines to expand volumes, pushing pits deeper than before, while huge cash margins on incremental tonnages reduced the importance of the relative cost advantages of draglines. During expansions the scalability and flexibility of truck and shovel/excavator fleets was also attractive, as these may be deployed in any area of the pit. As pits got deeper the relative share of work for draglines decreased from 75-100% in shallow pits to as little as 10% in some large, deep operations. Result: lower focus on optimizing dragline operations. Now the wheels have fallen off the commodities boom. The mantra of incremental tonnage is gone, replaced by a reborn focus on productivity and unit costs. Profitability at any cost base has been replaced by razor thin or negative margins, with a large proportion of mines now navigating loss making territory. In this situation, the focus is now firmly back on the use of low cost mining methods, and the corresponding engineering requirements to plan and execute at the lowest costs possible. Draglines and dozers are once again valued components of the mining system: when margins were $40/t a notional saving of 20c/bcm of overburden cost was irrelevant; now that margins are miniscule or negative, that 20c/bcm saving might be the difference between sinking or swimming.